Bacillus anthracis and Bacillus cereus can usually be distinguished by standard microbiological methods (e.g., motility, hemolysis, penicillin susceptibility and susceptibility to gamma phage) and PCR. However, we have identified 23 Bacillus spp. isolates that gave discrepant results when assayed by standard microbiological methods and PCR. We used multiple-locus variable-number tandem repeat analysis (MLVA), multiple-locus sequence typing (MLST), and phenotypic analysis to characterize these isolates, determine if they cluster phylogenetically and establish whether standard microbiological identification or PCR were associated with false positive/negative results. Six isolates were LRN real-time PCR-positive but resistant to gamma phage; MLVA data supported the identification of these isolates as gamma phage-resistant B. anthracis. Seventeen isolates were LRN real-time PCR-negative but susceptible to gamma phage lysis; these isolates appear to be a group of unusual gamma phage-susceptible B. cereus isolates that are closely related to each other and to B. anthracis. All six B. anthracis MLVA chromosomal loci were amplified from one unusual gamma phage-susceptible, motile, B. cereus isolate (although the amplicons were atypical sizes), and when analyzed phylogenetically, clustered with B. anthracis by MLST. MLVA and MLST aided in the identification of these isolates when standard microbiological methods and PCR could not definitely identify or rule out B. anthracis. This study emphasized the need to perform multiple tests when attempting to identify B. anthracis since relying on a single assay remains problematic due to the diverse nature of bacteria. Bacillus anthracis and B. cereus are two closely related gram-positive species belonging to the B. cereus group (B. anthracis, B. cereus, B. thuringiensis, B. weihenstephanensis, B. pseudomycoides and B. mycoides). Despite their close genetic relatedness, in general B. anthracis has several phenotypic characteristics making it easily differentiated from B. cereus and other members of the B. cereus group. B. anthracis is non-hemolytic on sheep blood agar, susceptible to penicillin, lysed by the gamma phage, and non-motile. Conversely, B. cereus is hemolytic on sheep blood agar, resistant to penicillin, resistant to lysis by the gamma phage, and motile. In addition, B. anthracis harbors two virulence plasmids, pXO1 and pXO2, which B. cereus lacks, although a recent reports have showed that rare B. cereus isolates harbor genes and similar plasmids closely related to pXO1 and pXO2 [1–6]. However, standard microbiologic identification can be complicated when isolates of B. anthracis are cured of both plasmids, are phage-resistant, or when rare non-hemolytic, gamma phage-susceptible B. cereus isolates are encountered . Recently, more than 600 B. anthracis strains were recovered from a large collection of Bacillus spp. isolates that had been stored at the Centers for Disease Control and Prevention (CDC) from the 1950s through the 1980s . All isolates were assayed using standard microbiological procedures, such as colony morphology on sheep blood agar (SBA) and the gamma phage susceptibility test . In addition, all isolates were assayed using the B. anthracis-specific Laboratory Response Network (LRN) real-time PCR, which has been shown to have 100% sensitivity and specificity and includes three separate targets: one region on the B. anthracis chromosome and one region on each virulence plasmid, pXO1 and pXO2 . During that study, 23 isolates were recovered that were not clearly identified or ruled out as B. anthracis due to discrepant results between standard microbiologic tests and the LRN PCR. In the current study we used multiple-locus variable-number tandem repeat analysis (MLVA) and multiple-locus sequence typing (MLST) to identify and differentiate the 23 isolates that gave discrepant gamma phage susceptibility and PCR results. MLVA uses eight loci (six chromosomal and two plasmid) to discriminate B. anthracis isolates. MLVA has differentiated B. anthracis into 89 genotypes in two major clusters (A and B) and was used successfully to link clinical, powder, and environmental isolates from the 2001 anthrax outbreak [11, 12]. In addition to its subtyping capabilities, Keim et al. reported that MLVA could be used to reliably identify B. anthracis because close relatives, such as B. cereus and B. thuringiensis, generally only amplify 0–2 MLVA loci, and any resulting allele sizes do not correspond to those observed in B. anthracis . MLST is based on the sequencing of defined segments of seven housekeeping genes and also has recently been introduced as a typing method for members of the B. cereus group [13, 14]. While this method is less discriminatory in differentiating B. anthracis isolates than MLVA, it has been used successfully to distinguish B. anthracis from its closest relatives within the B. cereus group. Both of these molecular methods, in addition to other standard microbiological methods, were used to characterize these 23 diagnostically challenging isolates, determine if they cluster phylogenetically, and establish whether standard microbiological identification or PCR were associated with false positive/negative results. The isolates in this study were chosen because they could not be definitively identified using gamma phage susceptibility and the LRN real-time PCR specific for B. anthracis which targets three genes: one on the B. anthracis chromosome and one on each virulence plasmid, pXO1 and pXO2. No isolates were positive for all three markers. Seventeen of the 23 isolates were susceptible to gamma phage lysis but gave negative results for all three LRN real-time PCR targets [Table 1]. Two of these isolates were beta-hemolytic on SBA, 14 were non-hemolytic, and one isolate was weakly hemolytic on SBA. The 14 non-hemolytic isolates had typical colony morphology of B. anthracis on an SBA plate, and with the exception of having negative PCR results, appeared to be consistent with B. anthracis. The remaining six isolates were resistant to gamma phage lysis and positive for the B. anthracis chromosomal marker used in the LRN real-time PCR. In addition to the chromosomal marker, two isolates were PCR-positive for the pXO2 marker and one isolate was positive for the pXO1 marker. The six gamma phage-resistant isolates were non-hemolytic and had the typical colony morphology for B. anthracis on SBA. All 23 isolates were susceptible to penicillin. Designation and characterization of 23 unusual Bacillus isolates recovered after long-term storage with conflicting PCR, gamma phage susceptibility, and colony morphology data. *B. cereus and B. thuringiensis cannot be definitively differentiated by MLST or by other methods used in this study. All 23 isolates were assayed by MLVA [Table 1]. All six PCR-positive, gamma phage-resistant isolates amplified all six VNTR loci located on the chromosome, indicating that these isolates were most likely gamma phage-resistant B. anthracis. In addition, one of the two plasmid markers was amplified in three of these isolates. Among the 17 PCR-negative, gamma phage-susceptible isolates analyzed by MLVA, 16 isolates only amplified 0–1 of the eight VNTR loci. Thirteen isolates produced a vrrA 282-bp amplicon, and one isolate produced a vrrA 261-bp amplicon. However, neither of these sizes has been previously observed in B. anthracis strains . Two isolates did not amplify any of the chromosomal VNTR loci and none of the 17 isolates amplified either plasmid VNTR loci. This data suggested that these isolates were gamma phage-susceptible Bacillus spp. and not B. anthracis. One PCR-negative, gamma phage-susceptible isolate, 2000031002, amplified all six chromosomal VNTR loci. However, four of the loci (CG3, vrrB2, vrrB1, and vrrC1) had previously unobserved allele sizes for B. anthracis. The other two loci were consistent with allele sizes previously seen in B. anthracis. All 23 isolates were assayed by MLST [Table 1]. The 17 PCR-negative, gamma phage-susceptible isolates were analyzed by MLST for further identification and to determine if these isolates were phylogenetically related. Three new sequence types (ST) were observed: ST 129, ST 130 and ST 132, all of which cluster in Clade 1, which includes the Anthracis lineage as defined by Priest et al. [Figure 1] . Fifteen isolates were identified as ST 129. Of the 15 isolates, one was hemolytic; the remaining isolates were non-hemolytic. One weakly hemolytic isolate (2000031002) was designated ST 130, and an additional hemolytic isolate (2002013100) was designated ST 132. ST 129 and ST 132 clustered with other B. cereus STs in Clade 1, which includes the Anthracis lineage, but were sufficiently divergent from the B. anthracis STs, allowing clear differentiation. ST 130, however, grouped within the B. anthracis lineage [Figure 1] and is a double-locus variant of ST 1. 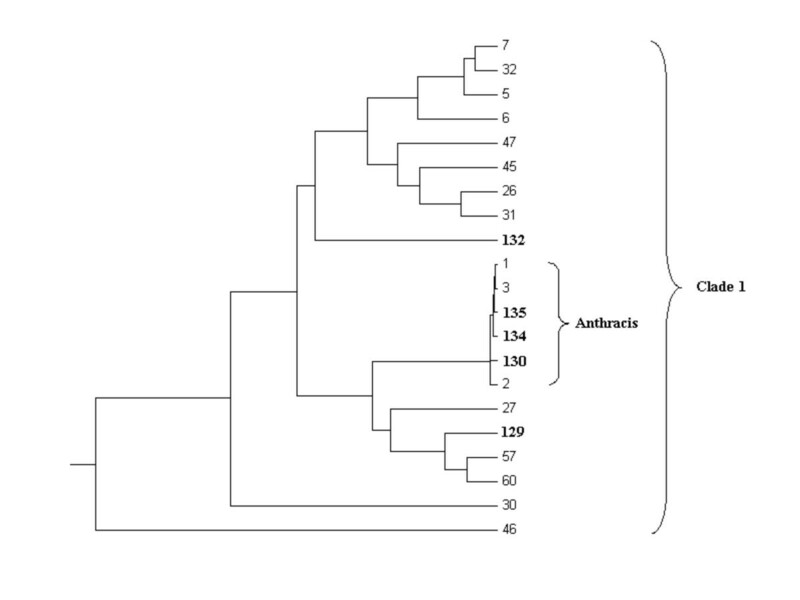 Dendrogram of UPGMA analysis in MEGA of concatenated sequences based on the Clade 1 STs in Priest et al.. The five new STs determined in this study, ST-129, ST-130, ST-132, ST-134, and ST-135 are in bold. MLST performed on the six gamma phage-resistant isolates identified four isolates of ST 1 and single isolates of ST 134 and ST 135, both of which are new STs observed for B. anthracis. These three STs all cluster within the B. anthracis lineage [Figure 1]. Discrepancies between standard microbiologic identification and the LRN PCR results were observed for 23 isolates that were recovered after long-term storage. MLVA and MLST were performed to aid in resolving the discrepancies and identify these isolates. For the six gamma phage-resistant, PCR-positive isolates, all six chromosomal MLVA loci were successfully amplified supporting the identification of these isolates as gamma phage-resistant B. anthracis. Aside from being gamma phage-resistant, these isolates were typical B. anthracis. These isolates had the typical colony morphology, were non-hemolytic, susceptible to penicillin, and clustered with B. anthracis by MLST. All of the methods used in this study strongly support their identification as B. anthracis. Gamma phage-resistant B. anthracis, while uncommon, have been previously documented . For 16 of the 17 gamma phage and penicillin susceptible, PCR-negative isolates, MLST analysis supports the identification of these isolates as B. cereus that are closely related to each other and to B. anthracis based on their STs and position in Clade 1 (as described by Priest et al.) . While B. cereus and B. thuringiensis cannot be distinguished by MLST, Clade 1 is comprised of predominantly B. anthracis and B. cereus strains. The MLVA data also supported the identification of these isolates as B. cereus. Previous reports have documented the existence of gamma phage-susceptible B. cereus isolates such as these, but they are rarely encountered . Since the identification of the B. anthracis gamma phage receptor has recently been characterized, it would be interesting to sequence the gamR gene of these isolates and to correlate these results with gamma phage susceptibility . One PCR-negative, gamma phage-susceptible isolate, 2000031002, collected in 1960 from the Belgian Congo, provided the most peculiar results. This isolate was penicillin-susceptible, amplified all six MLVA chromosomal loci (although four allele sizes were unusual), and clustered with B. anthracis strains by MLST. It has been previously documented that a limited number of MLVA markers will amplify in B. cereus or B. thuringiensis , and a small number of closely related non-B. anthracis isolates have been identified that amplify all six chromosomal loci (although the alleles were sizes not previously seen in B. anthracis) [P. Keim, personal communication]. However, this isolate was weakly hemolytic and motile (data not shown). In addition, this isolate was PCR negative for both plasmids markers by the LRN real-time PCR and also did not amplify the MLVA plasmid markers. Although this isolate has several characteristics consistent with B. anthracis, based on the specificity of the PCR (as previously described and in this study), unusual VNTR allele sizes, and the lack of previous documentation of motile B. anthracis isolates, this isolate is most likely a very unusual B. cereus. The isolates in this study are a small subset of a larger Bacillus spp. collection that was recovered after long-term storage (between 20–50 years) and limited descriptive information is available for many isolates in this collection . For the isolates that we studied, we presume that the gamma phage-resistant B. anthracis were pathogenic when first isolated but lost the pXO1 and pXO2 plasmids during storage . We presume that isolates of human and animal origin were fully virulent when first isolated as both plasmids are needed to cause disease. Marston et al. showed many of the isolates in the original collection had loss one or both virulence plasmids during storage . In addition, environmental isolates were most likely virulent at the time of collection because these isolates followed the same pattern of plasmid loss over time as the clinical isolates in that study. For the B. cereus isolates, it is more difficult to ascertain their pathogenicity as B. cereus isolates can exhibit a wide range of virulence and cause a variety of infections . Several methods suggest that isolates closely related to B. anthracis tend to be clinical (versus environmental) in nature [13, 18, 19]. However, MLST data has shown clinical isolates including isolates associated with severe disease are not clonal or restricted to the B. anthracis Clade. Thus, pathogenicity can not be confidently deduced based on their phylogenetic relatedness. In addition to having a negative result for the chromosomal marker, none of the gamma phage-susceptible B. cereus isolates were PCR positive for either plasmid marker. Their original identification was most likely based on phenotypic characteristics, as molecular methods such as PCR were not available at the time of collection and the plasmid profiles of these isolates could not be easily determined. Although B. anthracis and B. cereus are very closely related, they differ greatly in their pathogenicity which is generally attributed to the presence of plasmid encoded factors. For B. anthracis, these virulence factors are encoded on pXO1 and pXO2; however, recent reports have shown that other species can harbor genes and plasmids similar to pXO1 and pXO2 [1–6]. The possibility of horizontal transfer or curing of plasmids emphasizes the importance of using a chromosomal marker for the identification of B. anthracis. A primary concern when encountering unusual Bacillus isolates such as those included in this study is the need to positively identify or rule out B. anthracis. These isolates could not be definitively identified using gamma phage susceptibility, hemolysis on SBA, and penicillin susceptibility. B. anthracis isolates that are gamma phage-resistant or cured of both plasmids and rare non-hemolytic, gamma phage-susceptible B. cereus isolates can complicate the identification of B. anthracis. Rarely, B. anthracis can be resistant to gamma phage lysis (1% of B. anthracis isolates that were originally recovered from storage in our collection). In addition, some B. cereus isolates that are phylogenetically closely related to B. anthracis are gamma phage-susceptible. Interestingly, 15 of 17 gamma phage-susceptible isolates were indistinguishable by MLST (ST 129), and all three STs identified (ST 129, ST 130, and ST 132) cluster closely with B. anthracis in Clade 1. Thus, isolates that were closely related phylogenetically to B. anthracis were also phenotypically similar to B. anthracis. In this study, the combination of MLVA, MLST and the LRN PCR data were used to identify gamma phage-resistant B. anthracis isolates and B. cereus isolates phylogenetically and phenotypically very similar to B. anthracis. Although the PCR was found to be specific, our findings support our assertion that reliance on a single assay remains problematic due to the diverse nature of bacteria and concerns of potential bioengineering. From a collection of more than 600 isolates initially identified as B. anthracis at the time of isolation and storage, upon recovery, 23 isolates (4%) could not be definitively identified or ruled out as B. anthracis and were therefore further characterized in this study [Table 1]. With the exception of one isolate that was collected in 1974 (2002721544), all isolates were collected in the 1950s and 1960s. Source information was available for 10 isolates (9 environmental, 1 animal). The isolates were collected from five states throughout the U.S. and four different countries on three different continents. One colony from each recovered isolate was inoculated heavily onto half of a sheep blood agar (SBA) plate. Subsequently, a single line perpendicular to the previously streaked area was streaked down the center of the plate. The second half of the plate was streaked to yield a confluent lawn, leaving approximately 1 cm between the two streaked halves. Each half of the SBA was inoculated with 5 μl of gamma phage. The plate then was marked to indicate where the phage was inoculated. The phage inoculum was allowed to dry, and the plate was incubated at 37°C for 18–24 h in ambient atmosphere. An isolate was considered susceptible to gamma phage lysis if there was a clear or partial plaque (area with no growth) on the SBA where the phage was inoculated. Gamma phage-resistant isolates had confluent growth at the point of gamma phage inoculation. Hemolysis of isolates was observed on the SBA and recorded after 18–24 h. For both assays, B. anthracis ATCC 4229 was used as a positive control, and B. cereus ATCC 14579 was used as a negative control. All isolates were assayed using the Laboratory Response Network (LRN) real-time PCR assay for B. anthracis as described by Hoffmaster et al., which targets three separate markers: the saspB gene on the B. anthracis chromosome, the pagA gene on pXO1, and the capA gene on pXO2 . The assays were performed on the Lightcycler (Roche Diagnostics, Indianapolis, IN) or the Smart Cycler (Cepheid, Sunnyvale, CA) instruments. All three primer/probe sets (targeting both B. anthracis virulence plasmids and a chromosomal marker) were used. A confluent lawn of growth was streaked onto an SBA plate. One penicillin disk (10 U, Remel, Lenexa, KS) was placed on the agar. The SBA was incubated at 37°C for 24 h in ambient atmosphere. B. cereus ATCC 14579 and the B. anthracis ATCC 4229 were used as negative and positive controls, respectively. Isolates observed with any zones of inhibition were considered susceptible. MLVA was performed as previously described by Keim et al. . Briefly, six chromosomal (vrr A, vrr B1, vrr B2, vrr C1, vrr C2, CG3) and two plasmid (pXO1-aat, pXO2-at) loci were amplified. Each amplicon was labeled with one of three dyes and analyzed on an ABI 377 automated DNA sequencer (Applied Biosystems, Foster City, CA). ABI Genescan software (Applied Biosystems) was used to analyze gel images. The MLST scheme described by Priest et al. was used in this study with the following modifications . Seven housekeeping genes were sequenced: glpF, gmk, ilvD, pta, pur, pycA, tpi. Amplification was performed using a Roche Expand Hi Fidelity PCR System (Roche), with each reaction containing 200 μM dNTP mix, 0.4 μM of the forward and reverse primers, 1× reaction buffer (with MgCl2), 1.25 units of Expand Polymerase, and 1 μl of template . PCR was performed on an ABI 2400 or 9700 thermalcycler (Applied Biosystems). Reactions were first incubated for 5 min at 95°C. Then 35 cycles were performed as follows: 15 sec at 94°C, 15 sec at the annealing temperatures noted in Priest et al. , except for pta which was annealed at 58°C, and extension for 1 min and 30 sec at 72°C. Reactions were then incubated at 72°C for an additional 5 min, with a final cooling to 4°C. PCR products were purified with a Qiaquick PCR purification kit (Qiagen, Valencia, CA). Sequencing was performed using the ABI BigDye terminator cycle sequencing ver 3.1 kit per manufacturer's instructions, with the exception of using 3 μl of BigDye with 1× reaction buffer instead of 8 μl of BigDye alone (Applied Biosystems). Sequencing products were purified using Centri-Sep spin columns (Princeton Separations, Adelphia, NJ). These sequencing products were resolved using an ABI model 3100 automated DNA sequencing system (Applied Biosystems). Sequences were analyzed using the GCG Wisconsin package ver 10.1 (Accelrys, San Diego, CA), MEGA ver 2.1 , and by querying the Bacillus MLST database . We thank Dr. Patricia Wilkins for her critical review of the manuscript. CKM performed original recovery of isolates, standard microbiological procedures for identification of isolates, MLVA, data analysis and drafting of manuscript. JEG performed MLST, data analysis and drafting of manuscript. TP participated in the design and coordination of study and drafting of manuscript. ARH participated in conception of the study, its design, data analysis and drafting of the manuscript. This manuscript has been seen and approved by all authors.